You call that that a sandwich cookie? THIS is a sandwich cookie. I don't know if it's been done before, but this very simple idea had to be done as soon as it came to me. Sugar cookies shaped into teeny tiny bread slices and made to look like sanwiches? The possibilities were endless...and so darn cute! My initial plans for BLT cookies were put on hold for something a bit simpler, so I could first check that the cookies would look enough like bread slices. 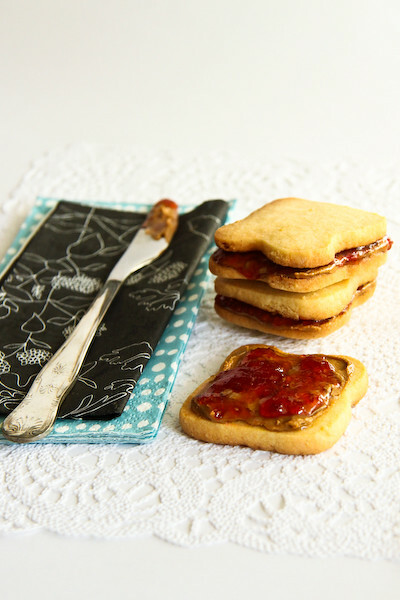 So I made some teeny tiny peanut butter and strawberry jam sandwich cookies. And fairy bread ones! For those unfamiliar with fairy bread, it's a fabulous treat that takes me straight back to birthday parties from my childhood, slices of white bread covered in butter and multicoloured sprinkles. I whipped out Martha's trusty sugar cookie recipe for this; it's very easy to handle and holds its shape without turning out rock hard. Though it's freezing cold in Sydney at the moment, so I had no problem with the butter in my dough melting. If you're doing this on a warm day, I'd definitely recommend sticking your dough in the fridge every now and then to keep it cool so it doesn't get greasy. It was so fun forming my cookie dough into mini 'bread loaves' and then slicing them up. They expand a tiny bit while baking, but less so the longer you chill the dough for. My house was filled with the wonderful smell of baked sugar cookies, and they came out looking so cute! It's best to take them out when they are still quite pale in the centre, as they tend to cook a bit further while they cool on the tray. I thought about dipping the edges of the cookie in chocolate to make it look more like it had a crust, but it wasn't worth it effort. Taste-wise, they are awesome. 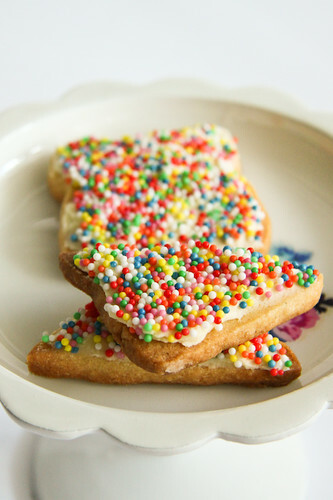 The fairy bread ones are made with a simple butter icing, which is delish! Definitely on the sweet side, but I love the novelty and I think kids would too. I have a thing for miniature food. And really, white bread is so full of sugar so it's not that different to a sugar cookie. I definitely preferred the open sandwich cookies to the closed ones, there was just wayy too much cookie when they are sandwiched together. But sandwiching does make transporting a lot easier, I ended up with jam and sprinkles everywhere. Feel free to just make the cookies and fill them with your own 'sandwich fillings'. Can't wait to try lots of different versions now! Sift flour, baking powder, and salt into a bowl. Place butter and sugar in the bowl of an electric mixer fitted with the paddle attachment. (If you're like me and don't have a paddle attachment, a regular mixer works fine on high speed, scraping the bowl down with a spatula every now and then) Mix on medium speed until pale and fluffy. Mix in eggs and vanilla. Reduce speed to low. Gradually mix in flour mixture. The mixture should form a soft & easy to handle, but not sticky dough. Divide dough into quarters; use your hands to roll each quarter into a rectangular block, about 4cmx5cm thick. (If the dough gets too soft, chill it for 10 mins so that it firms up) Using your thumbs and forefingers, pinch along the middle of the top and the two sides to form indents along the length of the block, so that the dough resembles a bread loaf. (See photo below) Keep the bottom of the block flat. Wrap in clingfilm and refrigerate until firm; at least 1 hour or overnight. Preheat oven to 180 degrees C and line baking sheets with baking paper. Remove dough from the fridge and use a sharp knife to slice 0.4cm slices of 'bread'. Slice them thinner if you plan on sandwiching two slices together in your final cookies. Place on baking sheet, leaving at least 3cm between each cookie. While you are slicing up your dough, place your prepared sheets of sliced cookies in the fridge to stay cool. Bake for 15-18 minutes, until edges turn golden. Let cool on baking sheets on wire rack. 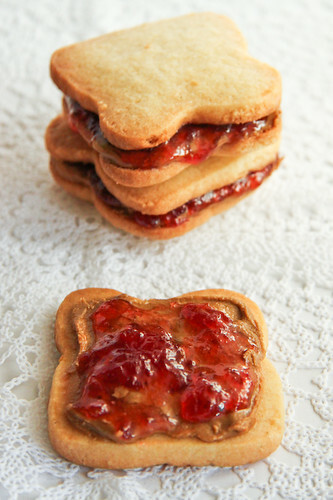 When completely cool, spread peanut butter & jam on the cookies, sandwiching two together if you prefer, or you can keep them open. 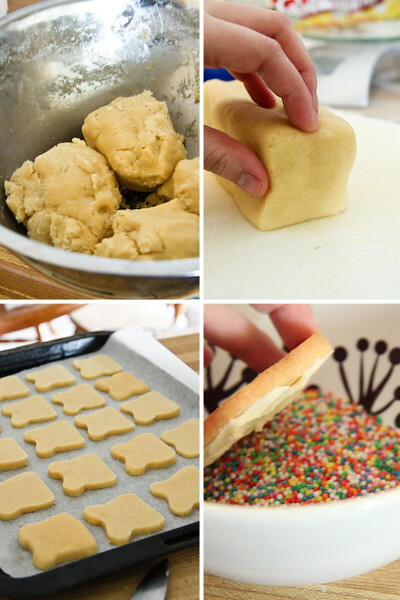 If you are making the fairy bread biscuits, remove butter from fridge 30 mins before starting. 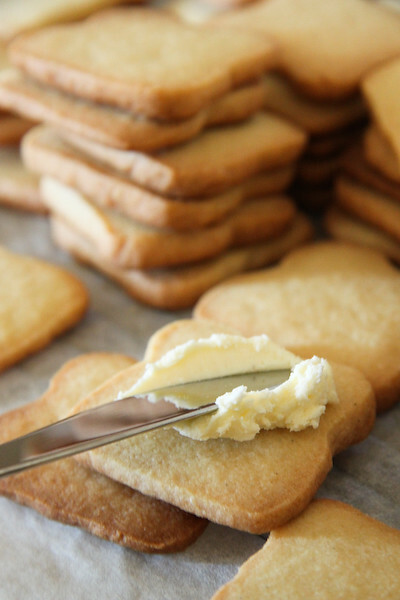 Beat butter with an electric mixer on high until it is fluffy and pale. Sift icing sugar in, beating to combine. You can keep adding icing sugar until it reaches your desired consistensy. Spread thinly over biscuits and dip into sprinkles. Can be stored for several days in an airtight container. I never got fairy bread before - couldn't understand why people loved it - I mean, eating bread with sprinkles just doesn't cut it for me - BUT THIS ONE - well - I'd love that fairy cookie for sure! You are always coming up with cute and creative things Steph! Peanut butter and jelly.....in a biscuit sandwich......why didn't I think if that?! Looks like I'll be baking some of these little futures today. What an inspired idea! Oh that's so so cute! I know about fairy bread but I've never actually had it before. The idea of sprinkles on white bread doesn't really appeal. But I like your take on it and this is something that looks like something I'll try! Fairy bread FTW! These are uber cute Steph! ahhaha just too awesome and cute! Those PB&J cookies are the bomb! Kids would go nuts for them at a party (or adults *ahem*). O O O HOW Adorable! LOVE this! super cute shape! they do really look like sandwiches! great! squeeee so cute!!! i <3 the pic of the unbaked slices sitting on the baking tray! These are soooo superly cute!!! hehe I love how these are mini sandwiches and cakewich is a huge sandwich! Fairy bread is so underrated. So freaking cute! Your are a genius! Lol, love your serviette :P Ikea FTW! And squee! Mini toast cookies <3! You're a total genius. 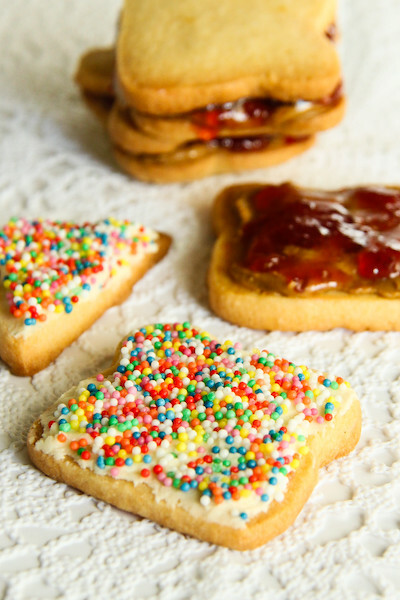 Fairy bread is pretty much what gets a lot of people through often painful children's birthday parties, and I think these biscuits could get you through just about anything. This is such a cool idea!!! Cutest thing EVER. I need this in my life. these biscuits are adorable! just curious - does the peanut butter and jam soften the cookies over time? Absolutely adorable!!! Yay! I love fairy bread (it always always takes me back to childhood), and I can imagine it being even better in miniature cookie form! This is so original! I am going to make it for my daughter and her friends during school holiday. I am sure it's going to be a big hit! Genius. This is the most original idea that I've seen this year. I'm going to give this a try! I mean, based on the adorable pictures, how could I not? These are adorable! What a creative and great idea! So brilliant and gorgeous, I'll have to post a link to your cookies on edible crafts (ediblecrafts.craftgossip.com). Thank you for sharing! Helen (Grab Your Fork) - Same here! And the rainbow tongue you get after :) A toast cookie cutter would have been great but this was just as easy! Alice - Haha that's what I was saying to myself after i thought of it! I can't believe I didnt think of it earlier! Celeste @ Berrytravels - Thank you!! You have to try it once, it's so fun! Phuoc'n Delicious - Agreed! :D thanks!! Jacq - Yeah it's so much more fun making your own cookie bread loaves and slicing it up! Thanks! FFichiban - Heehee thanks dude! Adriana - Aww yay! Success :) Thanks! Lisa - Yes, we should have real sandwiches for brekkie, my cookies for afternoon tea and your cake for dessert! Agreed, more power to the fairy bread! whisk-kid - Aww shucks *blushes* thank you! Conor @ Hold the Beef - I agree, fairy bread is all I can remember from kids parties. Thank you so much! panda - Thanks! Umm I'm not sure, I kept them in the fridge overnight and the biscuits were still very crisp, I left some out in the open for a couple of days and they were a tad softer but not heaps! Lucy - Thank you! it's so easy, you should! Brenda - :) I love anything that screams childhood memories! sabriena - Thank you! Hope you do make them! Helen - Aww yay, thanks so much! :) Yes please try them, let me know how you go! naomi - Thanks so much! This is adorable! I just definitely love it. This is something I should try. dining table - Thanks! Hope you do try them, they're super easy! I tried making this at 180 and it didn't work, but at 280 it did. Anonymous - please read the recipe properly. It states 180 degrees CELCIUS. That's 350 degrees fahrenheit. I am not a US blog. I love how you shaped and sliced the roll of dough! I may have to adopt that technique. 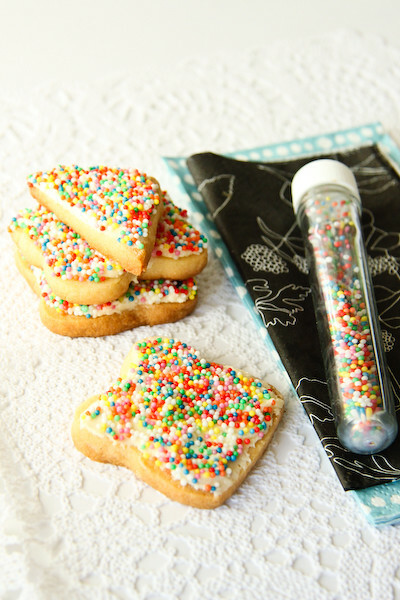 Super cute fairy bread too! Elise - Thanks! I actually made these a long time ago, this post was from August last year :) Your cookies looked cute!